There are no “do-overs” in life, so why should horror movies be the exception. This new version ignores decades of other sequels that feature Michael Myers, positioning itself as a direct sequel to the original. I guess it took them 40 years to get it right? David Gordon Green (“Stronger”) is the director behind the sequel that will no doubt please horror fans. Though, like pigs at a trough, most horror fans will eat anything. They lapped up all those previous versions, including the ones by Rob Zombie that all of a sudden they detest. Assessing “Halloween” like any other film at a film festival, it simply doesn’t stand out. There are no great performances, no stand outs or award worthy sound or production design. It’s a better than average October genre release that will quickly be forgotten outside it’s build in fandom when November arrives. Michael Myers (Nick Castle) has served 40 years in maximum security prison for the brutal murders he’s so famously known for. Two investigators arrive in Haddonfield, Illinois, on Halloween, in a desperate attempt to provoke the serial killer before he is transferred to a new facility and cut off from the world. A pothead friend of Allyson Strode points out that compared to the murder rate in 2018, on paper Myers case really isn’t worth all the fuss. Tell that to Grandma Strode (Jamie Lee Curtis) who has spent the last 40 years securing her home, shooting every type of weapon and praying that Myers will escape so she can kill him and the nightmares that haunt her. This Halloween, she might finally get her chance. 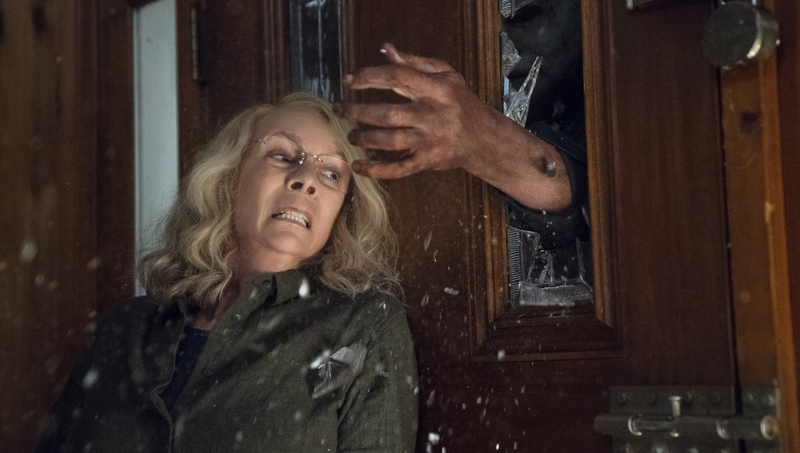 Assessing “Halloween” like any other film at a film festival, it simply doesn’t stand out. Probiotic yogurt spokesperson Jamie Lee Curtis returns to one of her most famous roles. The fit 59-year-old Curtis dons a “Madea wig” to play Grandma Strode, but the cleavage is still out. Most of the plot focuses on new characters, or new actors playing familiar tropes. No shock here, Judy Greer (“Jurassic World,” “Ant-Man”) is the daughter and mother to Allyson. Greer seems to always play the stereotypical mom, but director Green seems aware of that perception and uses Greer in the best way since “The Descendants.” However, the parts the younger actors play are poorly written and ill-conceived, reducing this sequel down to more standard horror genre fare than moments where the real actors try and elevate. There is one little guy that steals the show in a comedic way, but I will leave it at that. For some, the “Halloween” sequel might be too little, too late. The horror genre has suffered tremendous declines (like most genre films) and re-births since the first “Halloween” in 1978. The assembly line of low-budget horror flicks plaguing the market reduced the genre to an all-time low, I am looking at you found footage sequel shot on a dime budget. Green tries to get this film back to where it all started, and he almost gets there. So many films have been spawned from the success of John Carpenter’s creation that every death, murder, tense moment in the original version has been imitated by others over the last 40 years. Making truly original horror genre films like The Others or The Conjuring (the original not the endless mediocre sequels) or even Sam Rami’s The Gift feel far superior because of their ability to break outside the genre and the A-list talent involved. There is something not quite right about a theater full of people cheering when a murderer kills an innocent person on screen, and “Halloween” celebrates that profane violence. Will excite diehard fans, satisfy horror seekers, and disappoint anyone looking for an original film. Where are you getting this from? Most horror fans tend to fall on the picky, but discerning, side. More than fans of just about any other genre, they will NOT eat just anything. This statement just came across lazy, uninformed, and condescending. My point was, Chris, that fans of this series (like many others, especially in the horror genre) have already decided they love the movie, even before they see it. They will forgive almost anything, just simply because they are craving what’s being offered, and because they are already inclined to love it. Condescending, yes, I give you that. It bothers me that there is a huge line for a film like this, that champions violence and murder, yet, hardly anyone will see a film that might truly make someone become a better person. Thanks for reading. I understood what you meant, I just think it couldn’t be more wrong. Like I said, horror fans really DON’T go into a series like this knowing they’ll love each new entry and certainly don’t automatically love it after they’ve watched (ever heard people’s thoughts on the last two entries by Rob Zombie)? Also, I think that you’re being a bit judgemental by bemoaning the long lines for a movie that champions violence and murder. It’s not about that – it’s just escapist fun. You have to realize that movies are universal, but not everyone watches them for the same reason. Not everyone is a cinephile. Some people watch everything they can – they study, they ponder, they look for a way to be a better person theough each film they see. Other people are just looking for something to do on Saturday night and are casual filmgoers at best. There’s naught wrong with that. We can’t assume that everyone is looking to get the same thing out of a night at the movies. Some people, myself included, can appreciate horror flicks like this, along with a good documentary or a foreign art house film. You can’t paint it as if it’s so black and white. I completely agree with what you are saying, and I really think you for a detailed and well versed response. My issue is that I attend 4+ public screenings a week. Screening for films that have not come out yet. The majority of the genre based ones (I’m talking your Venom, your Fifty Shades Freed, whatever Marvel or Horror film is out that week) the audience always applauds, everytime. I personally know people who watched Halloween in Toronto, raved about it, clapped as the exited, and then now, say “eh, it wasn’t really that great”. That is what I am talking about. They get caught up in the moment, the fanfare, the excitement of something new. They are not thinking clearly. I have written down in my notes for Rob Zombie’s Halloween flick that the audiences clapped for that too, however you are right, today, they bash it. I understand – I am a critic as well and attend those same screenings. However, I think the reaction that you’re seeing kinda works against your point. At those press screening, we are not sitting amongst “horror fans” (or, fans of any other genre) specifically. We’re sitting amongsr people qho are willing to wait in line for several hours to see whatever free movie that they can get into. So, yes, they definitely applaud at these types of movies, but they are not the types of fans that you described in your review. They’re people that are happy they got to see a movie without oaying and are hoping to get more… Those same people will line up for anything. I just think attributing that to “horror fans” is misguided and inaccurate. I guess we just have to disagree, the fans lined up in Toronto wearing masks, Halloween masks, etc, were certainly fans, and people paying to see the movie. But yes, the normal screening people also like anything, but I am talking more about people attending genre films at film festivals. Halloween is getting good reviews, I am in the minority, I understand that. But I review it just like I do any other movie, and for me it’s just more of what I have seen before, from the series, and from the genre. I have no problem with you not liking it (I actually didn’t care for it, either – my review was far more scathing, and yet I’m a lifeling horror fan – go figure). This isn’t about your opinions of the film. I just take issue with your over generalization of what you consider to be “horror fans.” And, of course they were wearing masks and going crazy – they were there specifically for that event. They are excited to be there. It doesn’t mean they like everything that’s thrown at them. I just think you should seriously reconsider such a blanket, condescending statement about the fans of an entire genre. Yours made it seem as if you don’t feel that they can think for themselves and are more a part of a hive mind. You can hate the film all you want, but why throw in the unnecessary dig? It doesn’t suit you well at all… Or, maybe it does – I don’t know. I know I wouldn’t feel good about it. I like that, a hive mind. I didn’t hate the movie at all, it’s neither worthy pr praise or hate because it’s so middle minded and in the middle ground. Who is the one throwing unnecessary digs? I guess my complaint is a larger one, that I am just turned off by a society who actually likes that type of thing, champions it, acts like it’s “the best movie of the year” when they won’t even go watch something like First Man or BlacKkKlansman or whatever movie that might actually make them better human beings. And I just have to disagree with you, the guys that get dressed up, stand in line for hours, they have predispositioned themselves to already like whatever they are fandom-ing. Rarely after all that self inflected hype can they have a critical and balanced opinion, in my experience. And now this argument has become as dull as the film. I am sorry if I offended you with my review, I meant no harm. But there are too many other, better films to be discussing than debating this mess.